Working with your advisory council and other boards should be one of the most rewarding experiences in your Extension career. At times, it also can be the most challenging. 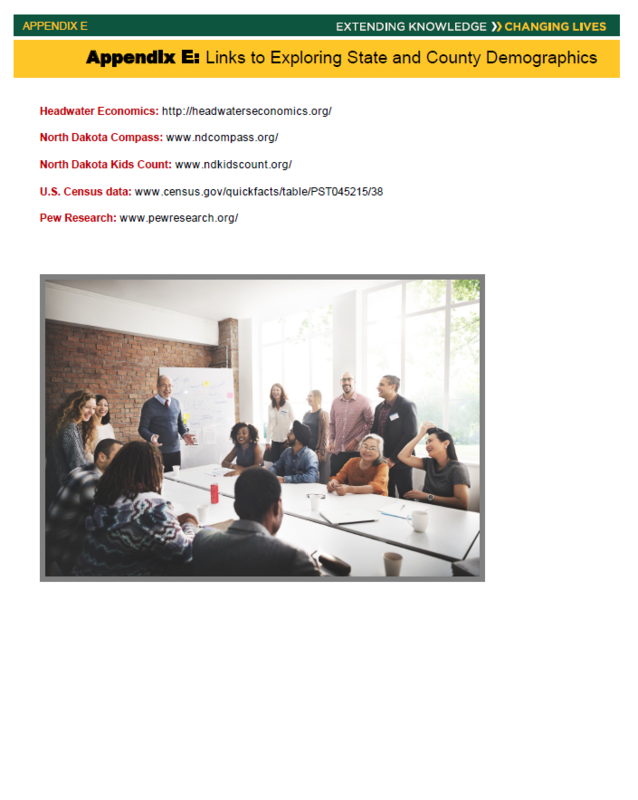 This training manual, Working Effectively With Advisory Councils and Other Leadership Groups, is designed to give you a practical look at ideas and examples that have worked for Extension professionals from numerous states. Today’s political, social and economic conditions call for strong volunteer advisory groups to extend the mission of Extension education. They can expand Extension’s presence in a community and represent our needs to governing bodies and decision makers at all levels. For them to represent us, we first must make empowering, motivating, and training our Extension advisory members a priority in our work. 10. Assist your successor — Having an effective advisory council in place is the best gift you can give a new agent coming into your county. 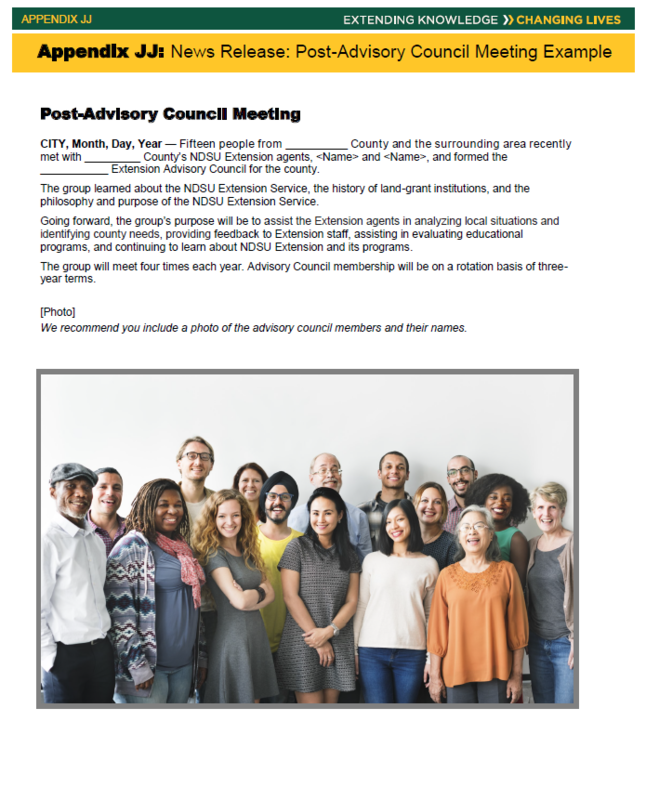 Advisory council members can assist the new agent in understanding the needs of your county, introduce the new person to key leaders in your communities, and provide a support system while this individual is getting established. 9. Give input about your programs — Knowing that the work you are doing is meeting the needs of your constituents is important. 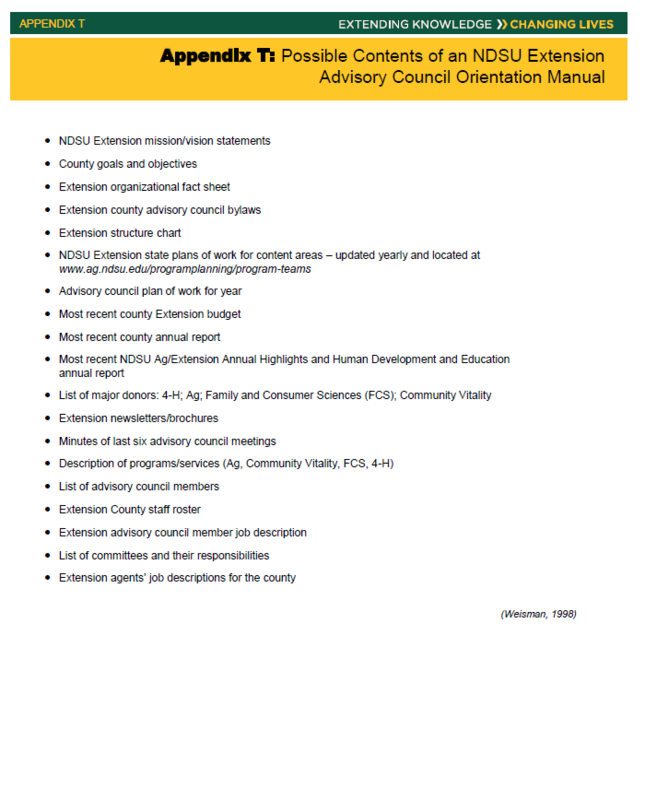 Advisory councils can be a barometer to gauge if you are making a difference in your county. 8. Make your work life easier — Advisory council members can assist you in prioritizing the programs that are most important to carry out during the upcoming year. 7. Help you sunset programs that are no longer relevant to your county’s needs — Sometimes giving up sacred programs is challenging, but if your council is telling you to and supporting you when you do so, ending a program will be easier. 6. 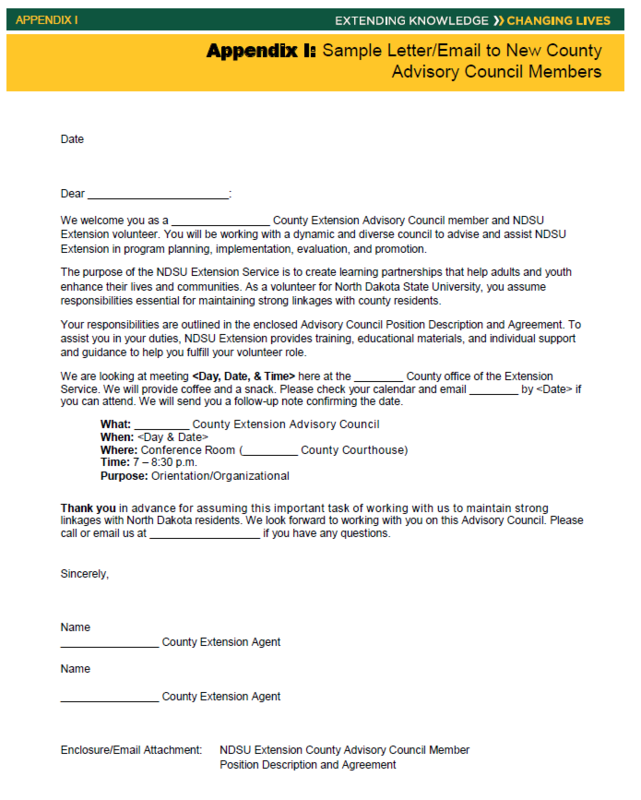 Have organized citizen input into your programming — Your advisory council can help you achieve NDSU Extension’s purpose, which is creating learning partnerships that help adults and youth enhance their lives and communities. 5. Make new connections, develop new advocates, and form new friendships in your county — As an Extension professional, you never can know too many people or be too connected. Your advisory council members also appreciate the connections they form with you and other members. 4. 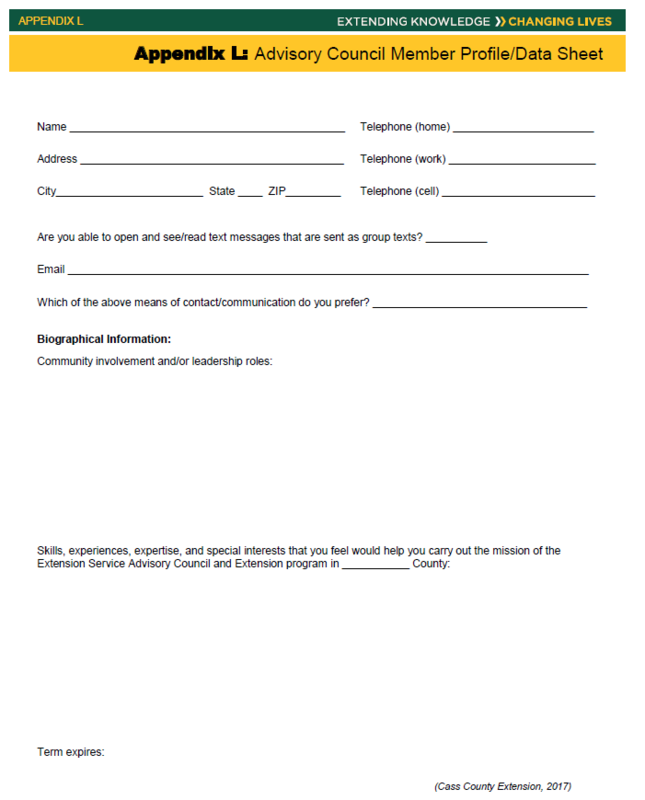 Offer individuals in your county a new leadership development experience — One of our roles in Extension is to develop people. Many Extension advisory council members have gone on to accept other leadership roles because they gained the confidence and skills to do so by being part of an Extension advisory council. 3. Tell the Extension story — Volunteers can be our best form of marketing. Inspired and empowered, advisory council members can be our best advocates to county residents, legislators, county commissioners, and other decision makers. 1. Leave a legacy for future generations — If the right individuals are members of your advisory council, they can assist in making sure the vision for Extension is carried out long after you ride off into the sunset. 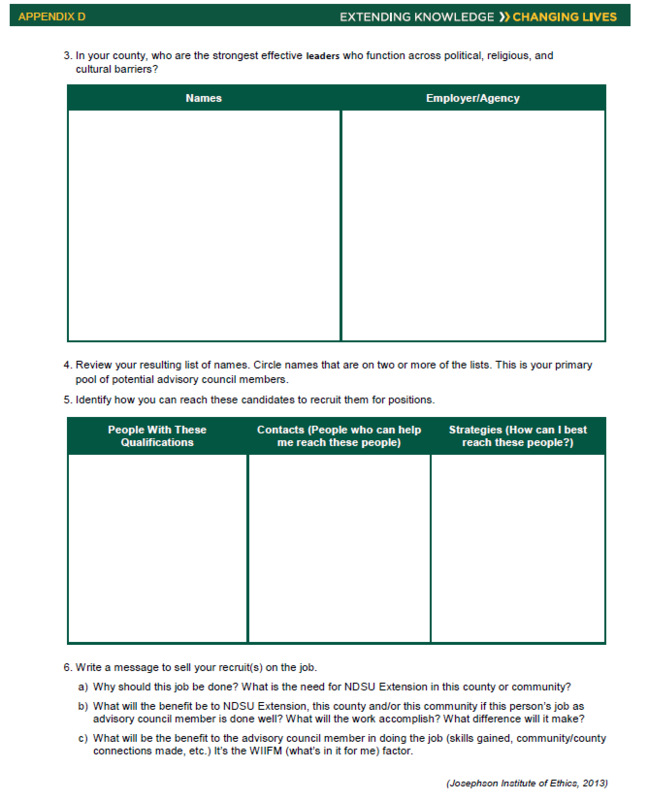 In NDSU Extension, creating and maintaining a volunteer delivery system is critical to the success of Extension program delivery. A volunteer delivery system is a unified, orderly process for coordinating and overseeing the work of volunteers and their partnership with staff at all levels of the county program. It is a comprehensive system that develops the processes to put all aspects of staffing together. Volunteer development engages individuals in an ongoing educational process designed to build capacities for service roles. Volunteer management is the utilization of volunteers to achieve organizational goals by individuals who manage programs, resources and inputs. Volunteer coordination is engaging volunteers and organizing volunteer efforts to accomplish desired goals. The ISOTURE model is the basis for the work we do with NDSU Extension volunteers. Working with Extension advisory councils is part of this delivery system. 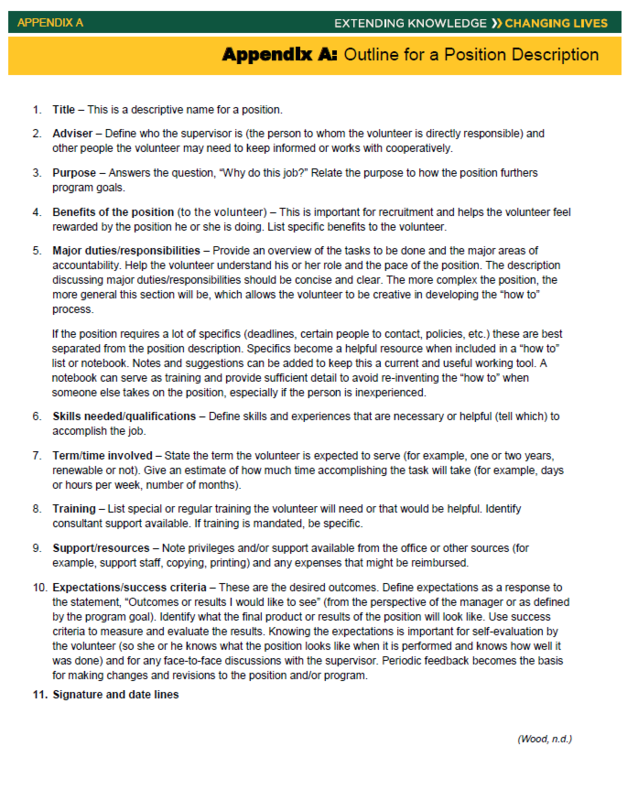 Therefore, this guide is structured using the ISOTURE model of volunteer development. The ISOTURE model of volunteer administration and development was developed by Robert Dolan, Ph.D. professor of Adult Education at North Carolina State University, in 1969. It was adapted by V. Milton Boyce, Ph.D. program leader for 4-H Youth Development, Extension Service, U.S. Department of Agriculture, in 1971 and introduced to county and area Extension agents to be used in local Extension programming. I – Identification: The process of finding people who have the competence and attitudes essential to fill specific leadership positions. This includes the identification of county Extension program needs and the volunteer roles to meet those needs, targeted recruiting for volunteers, identifying potential volunteers, and completion of a volunteer application. S – Selection: The process of studying the backgrounds of prospective volunteers identified and motivating them to fill selected positions. This includes screening potential volunteers, making reference checks, conducting interviews, and matching a volunteer to needed roles. 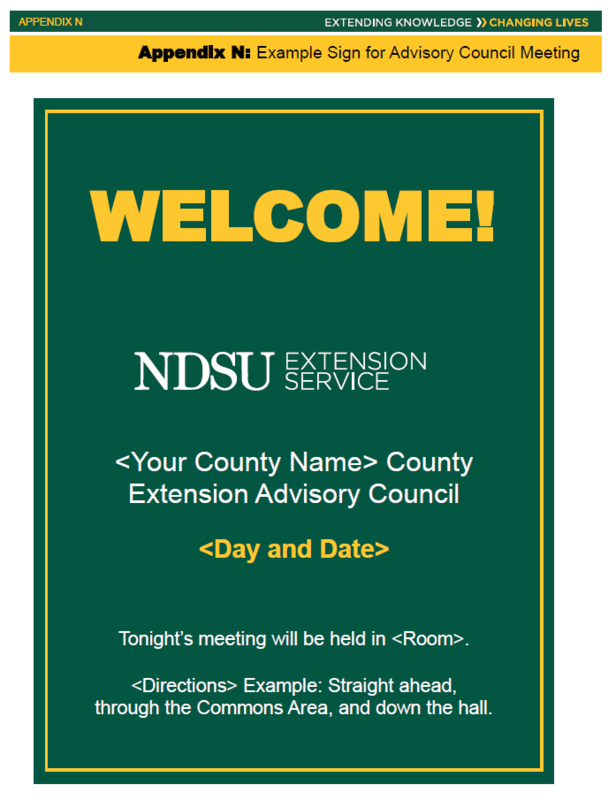 O – Orientation: The process of orienting volunteers to the expectations of the NDSU Extension and their volunteer role. This includes new volunteer training and support. T – Training: The process of stimulating and preparing volunteers to acquire knowledge and develop attitudes and skills necessary to enable them to be successful in their volunteer roles. This includes ongoing training through a variety of delivery methods. U – Utilization: The process of providing the opportunity for volunteers to put acquired knowledge and skills into action in the most appropriate way to function in a supportive environment. This includes support for volunteers to carry out responsibilities and to provide opportunities for mentoring from other volunteers and paid staff. R – Recognition: The process of recognizing and rewarding volunteers for their contribution and performance. This includes ongoing recognition through formal and nonformal methods. E – Evaluation: The process of determining how well a volunteer is doing in his/her role, providing useful feedback, assisting volunteers in achieving personal goals, and learning from the volunteer strategies to improve their role and the organization. This includes evaluation to create, adapt, and expand organizational volunteer delivery systems. 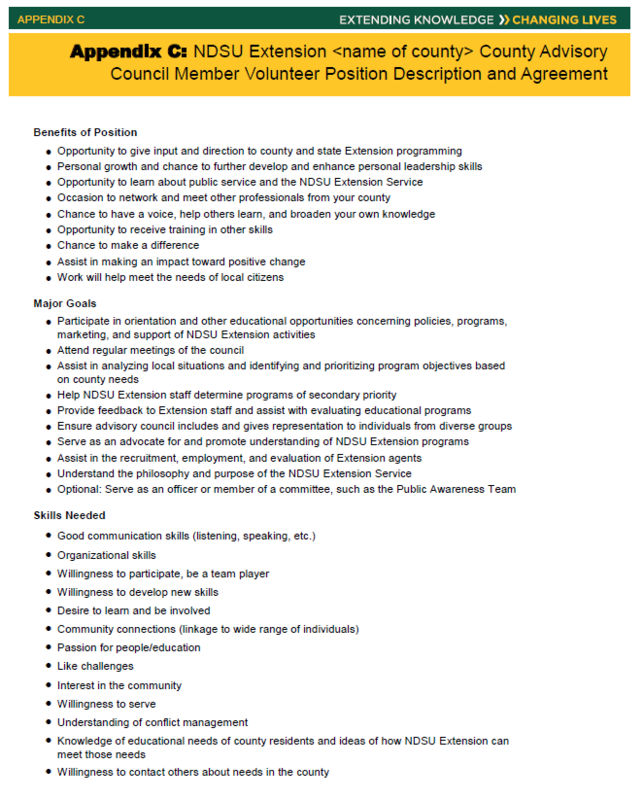 Extension Agent/Educator/Specialist – the professional person designated to work with the advisory group. Empowering – giving your advisory members responsibility, along with the authority and resources, to accomplish the mission of the board, council or committee. Motivating – instilling a sense of enthusiasm and ownership so your advisory members will want to accomplish their mission. 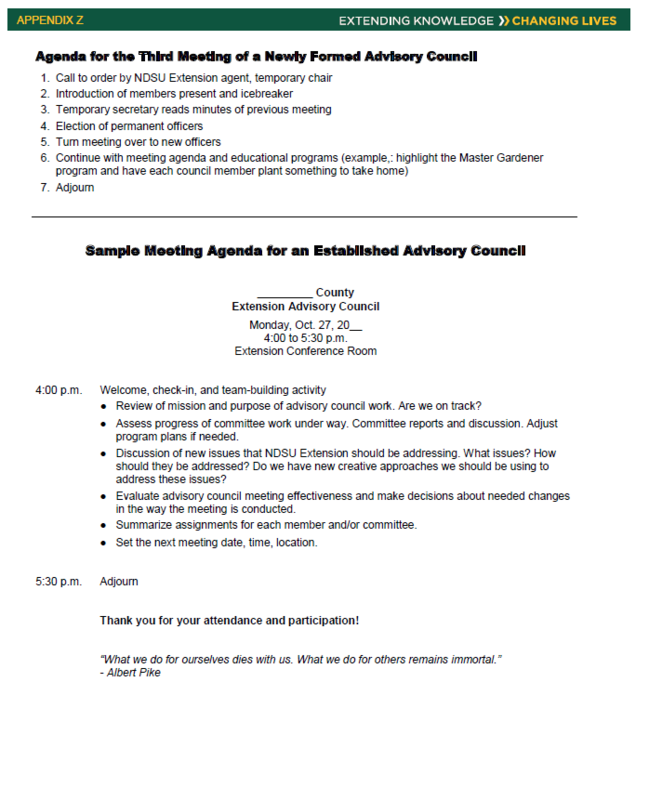 Active advisory council – this format serves as a vehicle for local residents to participate, influence, and provide support in the planning and implementation of Extension education programs in their community and county. 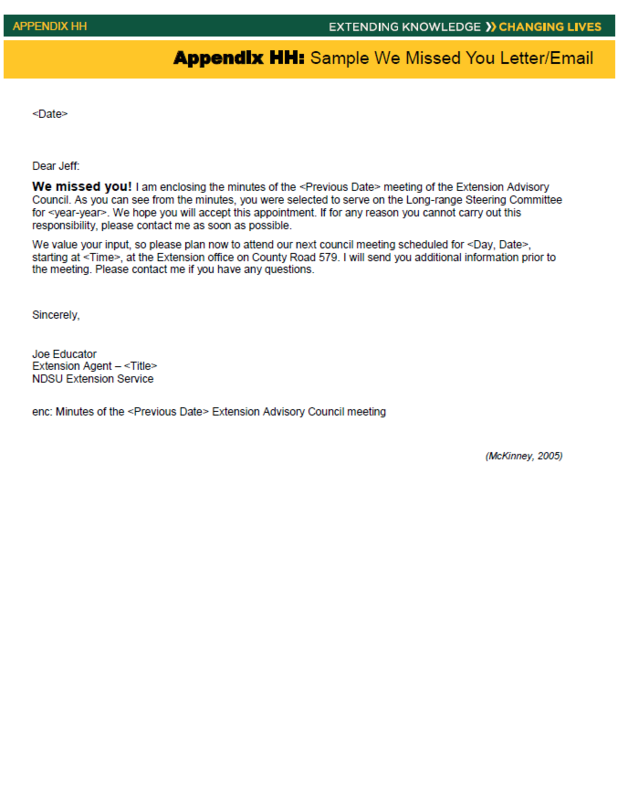 Inactive advisory council – not functioning/meeting. If you have an inactive council, please visit Appendix F for information to re-energize your council. Identifying the key constituent groups that should be represented on your advisory council and selecting individuals to represent those groups are two of the most critical components of establishing or maintaining a viable working advisory council. The representatives will determine the direction your organization will follow in serving the needs of your community. Who Should I Select to Serve on My Advisory Council? Select individuals with a genuine interest in your organization or program and look for people who communicate well with others. Look for individuals with a proven record for volunteering and consider citizens who do not have prior volunteer service or past association with Extension. Avoid personal friends and individuals with a personal agenda. Example: The angry father whose daughter was disqualified from the county horse show might not be the most objective person to serve on your advisory council. 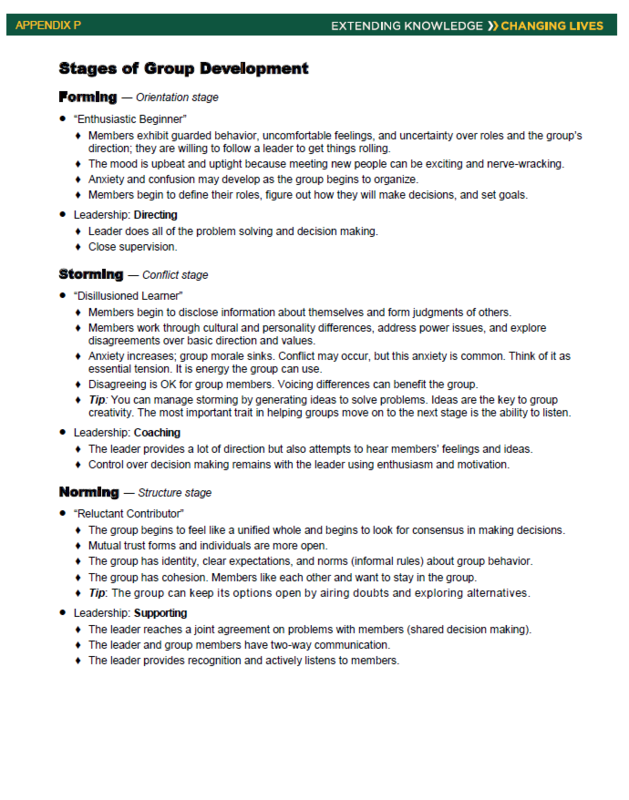 Try to balance your council with individuals who bring a wide range of interests and backgrounds to your group. 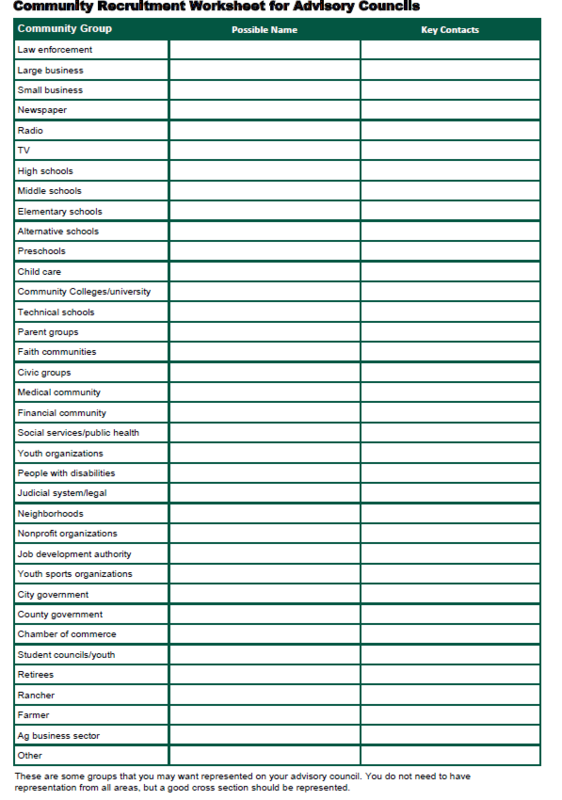 Example: A typical overall advisory council might look like this: school administrator, Chamber of Commerce representative, public relations consultant, banker or real estate broker, agricultural producer, teacher, several youth, nonprofit agency director, elected decision maker, collaborative agency member, community activist, former policymaker, 4-H leaders council representative, newspaper editor, faith community/ministerial association representative, retired senior citizen (See Appendix G). When selecting your advisory council, diversity is extremely important to keep in mind. Consider demographics such as gender, age, and ethnic makeup when selecting your membership. In addition, factors such as geographical boundaries, program representation and community profile are key in the selection process. Having a good mix of those with a strong tradition and affiliation with Extension and those with no prior association with Extension is important. We suggest that at least one county commissioner serve and act as a liaison between the county advisory group and the county commission. To assist you with forming a diverse advisory council, Appendix D has been created. 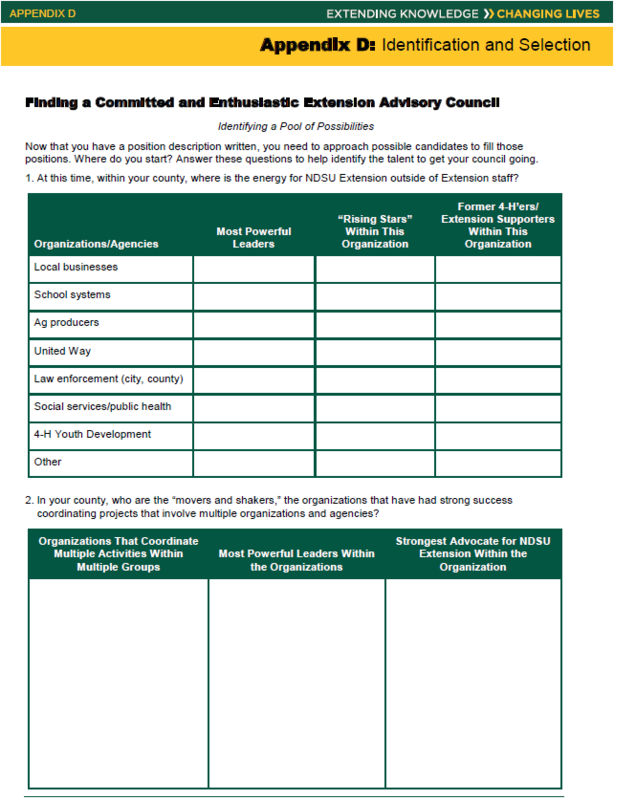 It contains Finding a Committed and Enthusiastic Extension Advisory Council, Community Recruitment Worksheet for Advisory Councils and Selecting a Diverse Advisory Council Grid. Please consult Appendix E to view your county’s demographics related to age, gender and ethnic diversity. 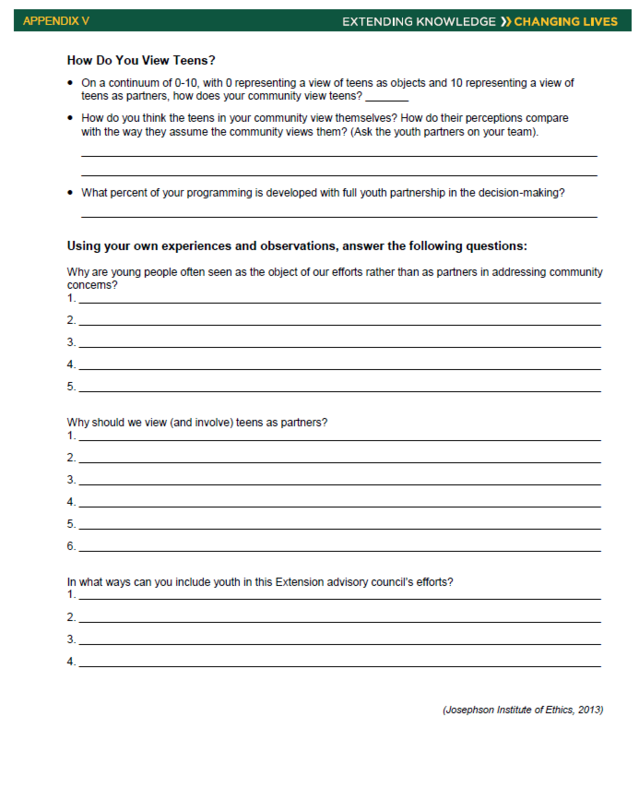 Appendix V also contains information on including youth as partners. From time to time, unseating a member from your group might be necessary. Most often, this is because of poor attendance. 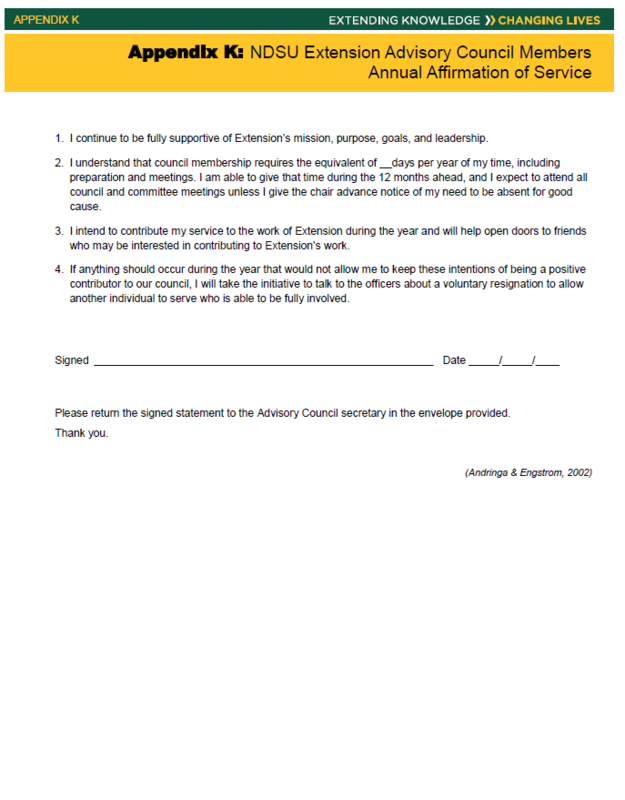 For your convenience, a sample letter of dismissal is included in Appendix II. 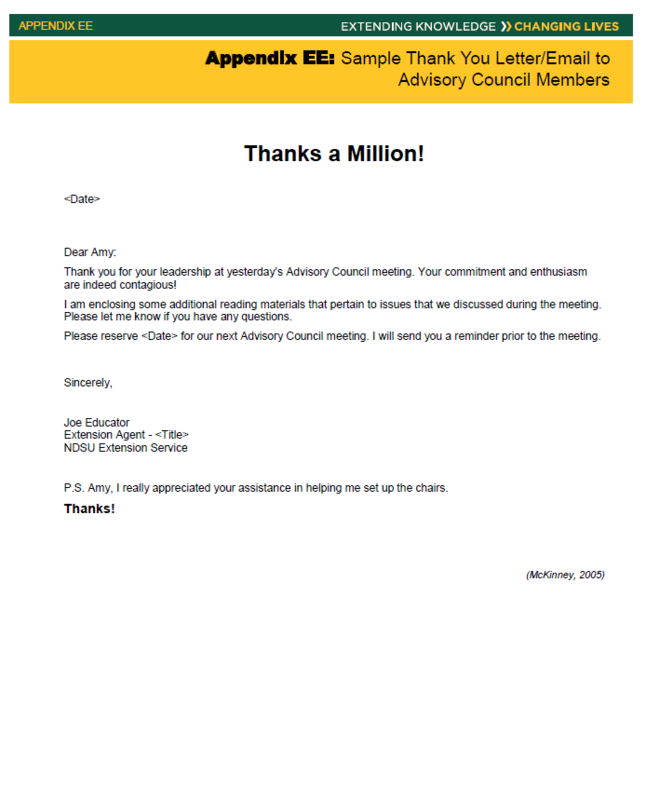 How Big Should I Make My Advisory Council? Advisory councils should have 15 to 25 members. Subcommittees can be established to perform specific work as needed. Again, this will depend on your own situation and/or administrative directive. However, being up front with your prospective members and letting them know in advance the amount of time and commitment necessary to fulfill their obligation is extremely important. Program committees generally tend to be less formal and require fewer meetings to complete their task. However, overall Extension advisory councils require more structure and commitment. This type of advisory council needs to have some structure in the form of bylaws (Appendix Y) or operating procedures to cover such things as term limits (Appendix M), attendance (Appendix O), duties of the officers, and a clear mission and vision of the group. Bringing in new people with new ideas is important. The fastest way to generate an inefficient and stagnant advisory council is to retain the same members year after year. 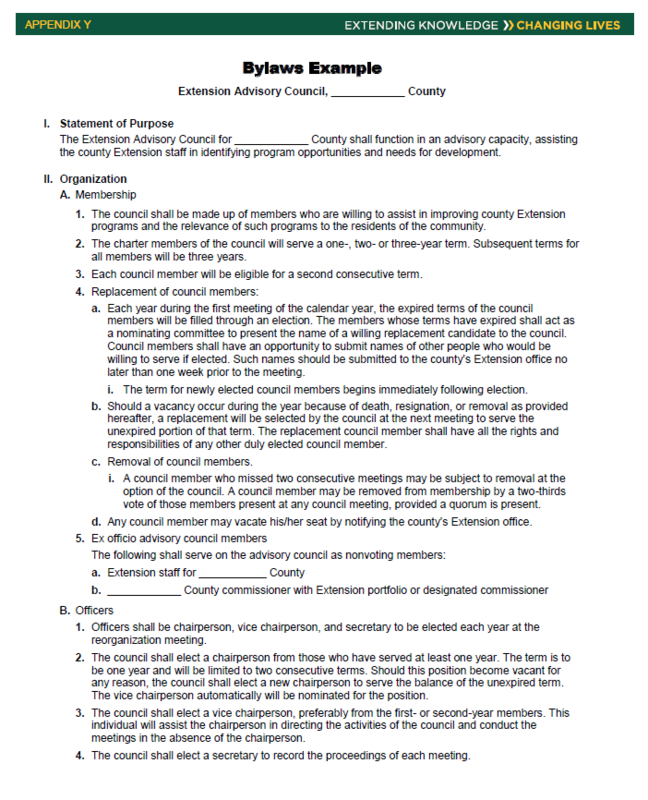 Ideally, people will commit to serve a minimum of three years on an overall advisory council on a staggered-term rotation schedule as seen in Appendix M.
If this is your first advisory council meeting, you will need to work with the group to brainstorm a set of ground rules and develop bylaws for governing the council meetings. 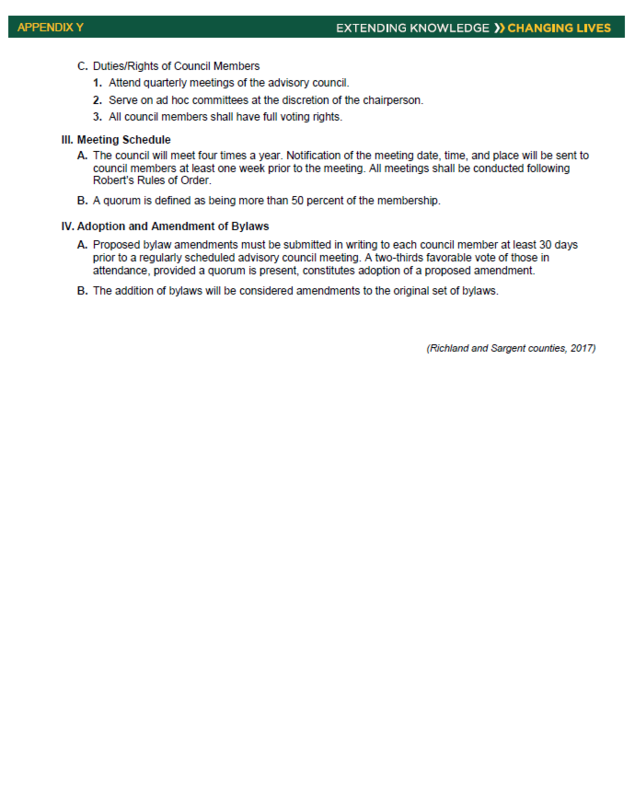 Appendix X includes an example of some common group ground rules. 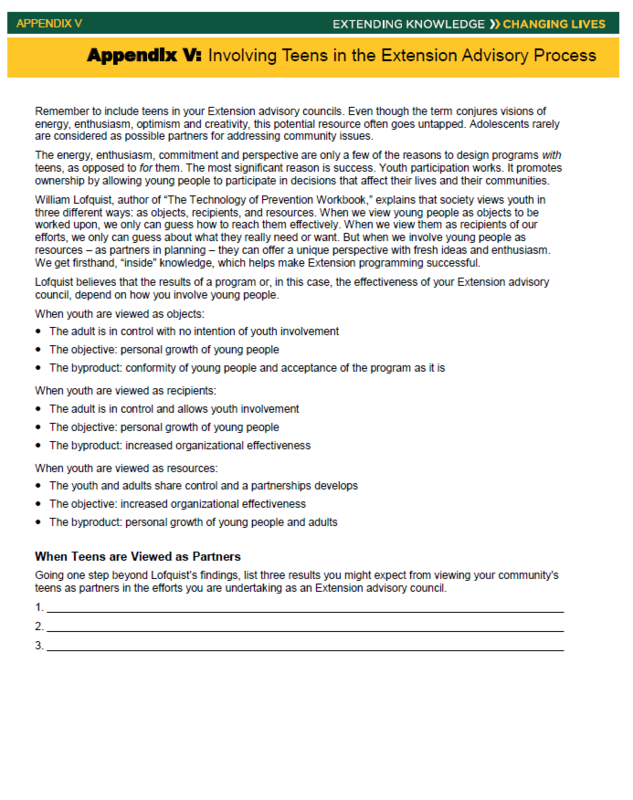 Appendix Y also contains an example of an Extension Advisory Council Members Guide. 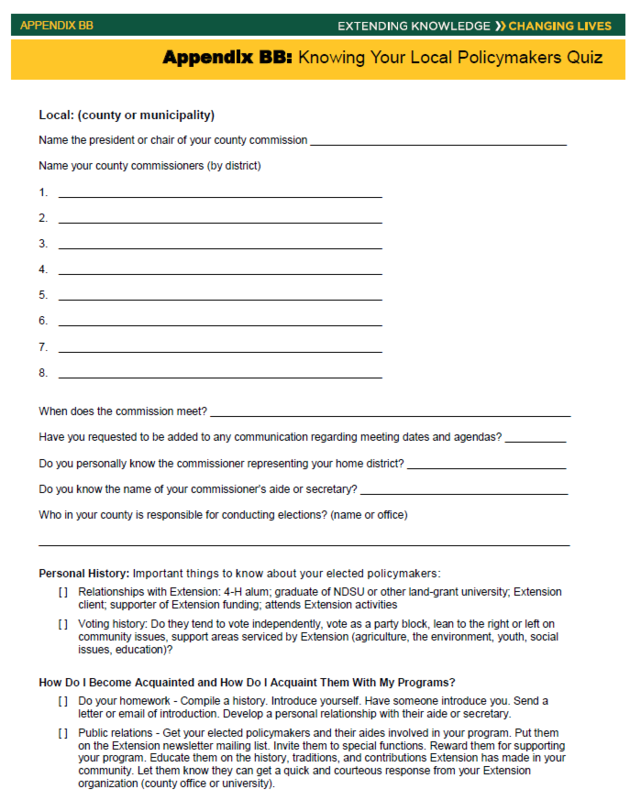 This may be used as a reference while creating your resources or adapted to suit the needs of your county council. One of the best ways to recruit a volunteer is to be a volunteer yourself. Remember, Extension is not the only show in town. Other educational, governmental and nonprofit organizations will be contacting you to serve on their councils. Through this collaborative effort, you soon will be recognized as a team player and community resource. The number of organizational contacts you will make from this endeavor is amazing. Your collaborative effort will open many professional opportunities for you. You will obtain greater knowledge of your community, expand your presence in the community, have an opportunity to promote Extension, and educate other professionals about the many resources available through your university and county Extension offices. Orientation is a way of leveling the playing field for your new members. It is a perfect time to establish ground rules and review the group’s mission and vision. Orientation allows an individual to join a committee or council in progress as an informed equal with the existing advisory members. When orientation is not provided, volunteers report being less motivated to serve the organization. The orientation session provides the perfect forum for the Extension professional to explain the expectations, goals, and objectives for serving on the Extension advisory council. What Should Orientation Training Include? 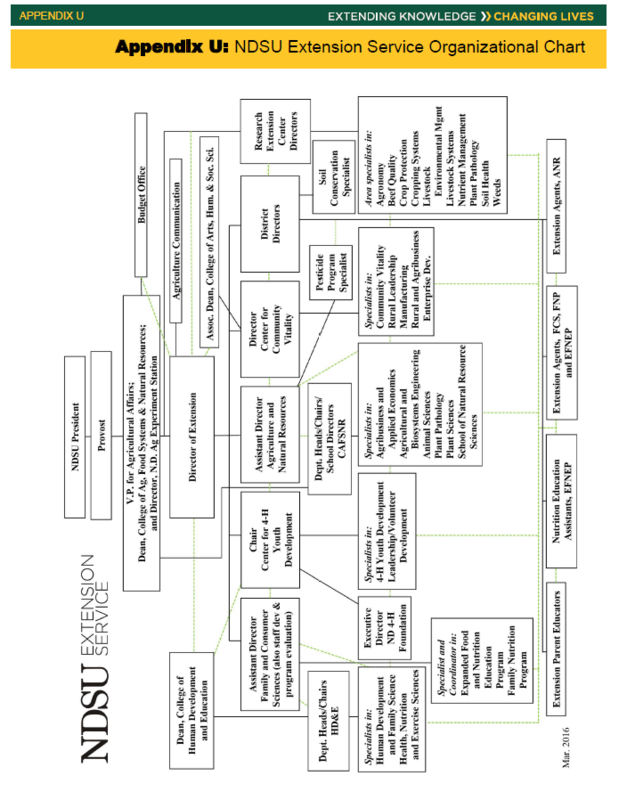 What the NDSU Extension Service is and what the relationships are with the federal, state and county partners. The NDSU Extension “Who We Are and What We Do” PowerPoint is an excellent resource to provide this information (2016). 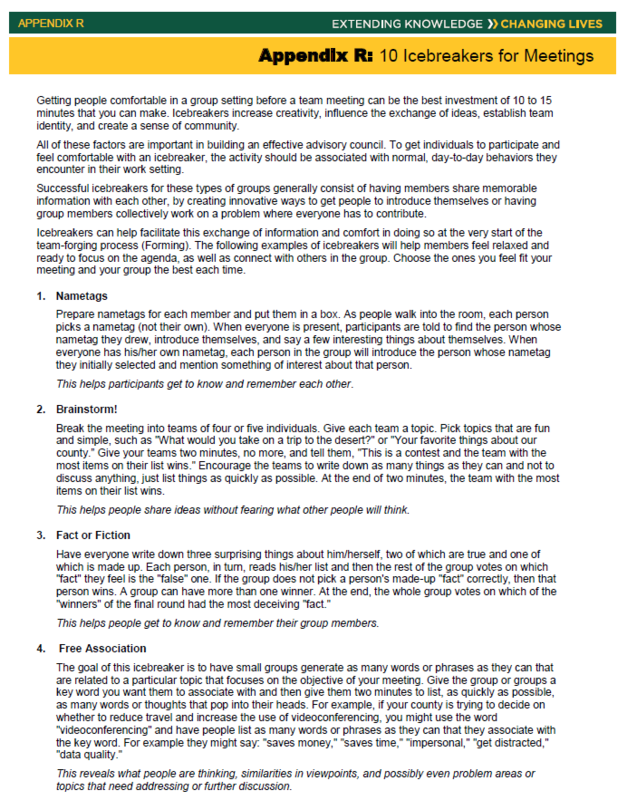 Establish or share group ground rules. See Appendix X for rule suggestions. Do not overwhelm your new members with a lot of statistical data. Keep the orientation session short (60 minutes or less is ideal). Make the session relaxed and comfortable (provide refreshments). Share a little about yourself with the group (let them get to know you as a person as well as an Extension professional, and do the same with them). See Appendix R for icebreaker activity ideas. Give your new members an orientation packet to take home. Appendix Y provides some suggestions for material you might include in your packet. Ongoing training of council members is important for maintaining a vibrant advisory council. Volunteers should receive training that allows them to attain knowledge, attitudes, and skills that improve the level and quality of their performance on your advisory council. Plan for and provide formal and informal training opportunities. Formal: presentations or workshops on a specific subject. Ex: Efficient Parliamentary Procedure Practices, Understanding the Community Capitols, Real Colors, Working With Generations, Positive Youth Development, etc. Build in some fun, educational opportunities such as “Understanding 4-H Shooting Sports” and have them shoot a bow and arrow, “Understanding 4-H Crops Judging” and teach them what to look for and have them judge, or “Container Gardening” and have them bring one home. 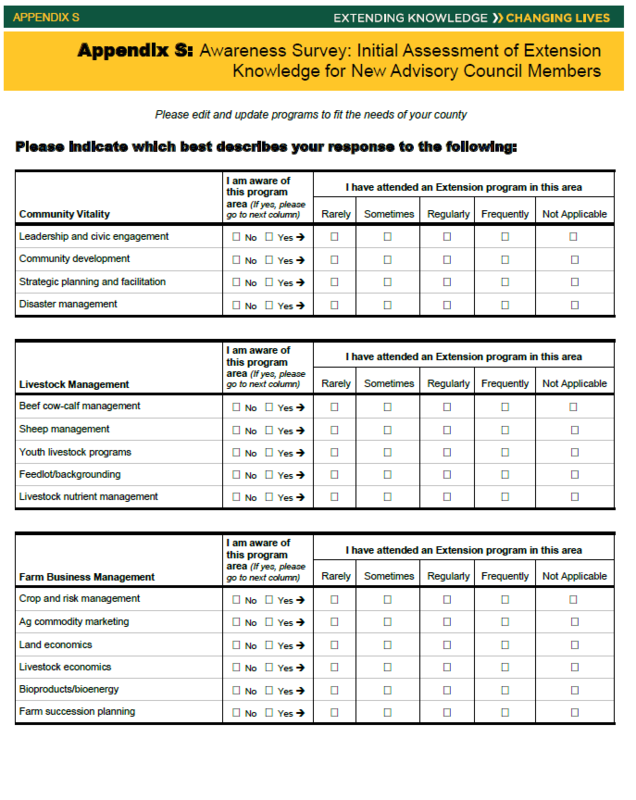 Complete the NDSU Extension Awareness Survey in Appendix S to discover the areas where members need training. Provide a quick educational opportunity at every meeting. 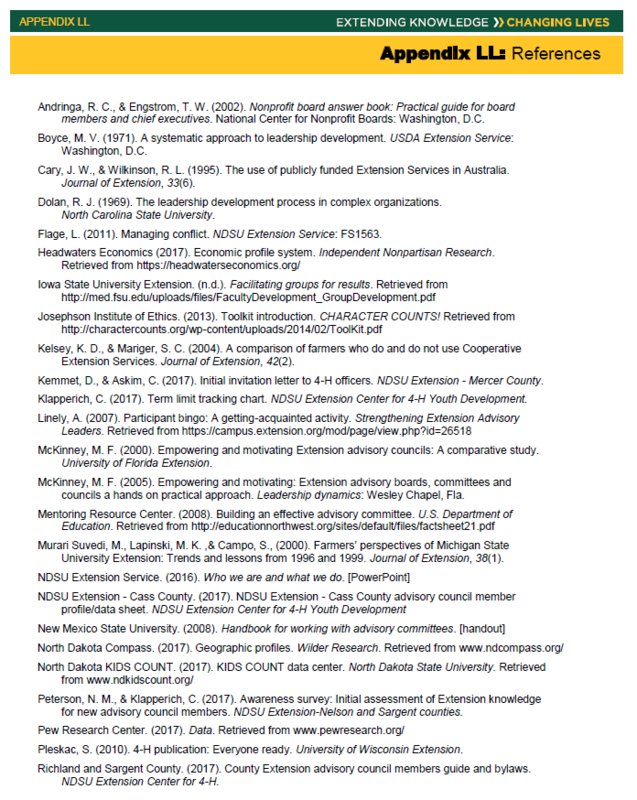 Review Your Extension Advisory Council Members Guide. Review the NDSU Extension Diversity Power Point found in Appendix W.
Gather the members’ input about their educational needs around being an Extension advocate and adviser. Utilizing: How Do I Motivate My Council Members? The answer seems almost too elementary, but it is so true: The best way to motivate your volunteers is to be motivated yourself. Motivation and enthusiasm are extremely contagious. Most Extension councils are just waiting to be infected! The simple truth is that we hold the keys to motivating our council members, and we have to assume the blame if we fail. Project a friendly and positive persona: Do this even when you have a down day. How can we expect our volunteers to be excited about our program when we fail to project a positive image? Meet frequently: In a study conducted among six states, Extension advisory members reported that meeting frequency played a major factor in their levels of motivation. When a board, council or committee had three or fewer meetings a year, volunteers reported being poorly motivated, while 65.5 percent of those attending four or more meetings reported being extremely motivated (McKinney, 2000). Plan meaningful tasks and/or projects: In the same study, Extension advisory members said underutilization was one of the root causes of poor motivation and group apathy. 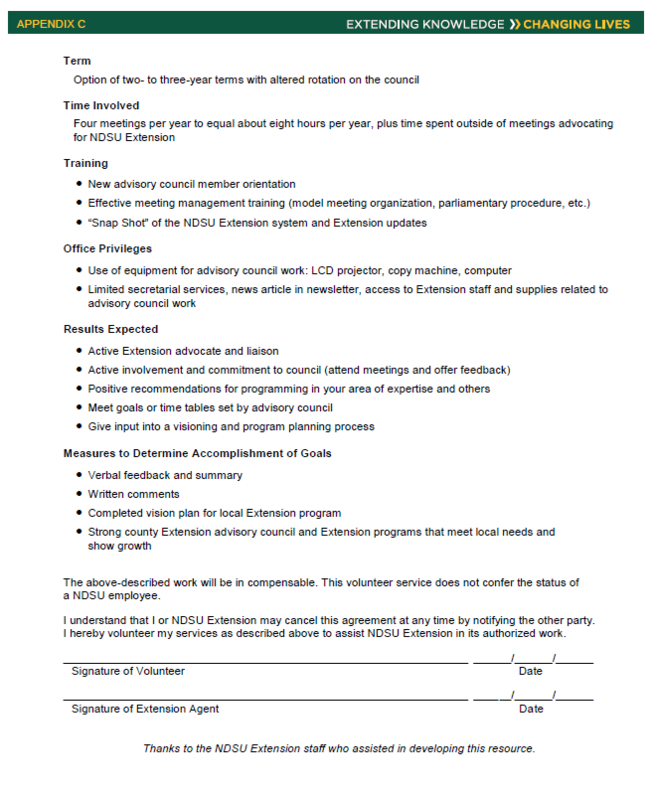 Having Extension professionals utilize their councils to the fullest is critical. Be creative: Getting people out of their seats and engaged in physical activity will enhance the motivation factor greatly in any advisory group. Be a listener: Advisory members are least motivated when Extension professionals dominate more than 50 percent of the discussion. As members assume a greater portion of the dialog and discussion, the motivation factor increases dramatically. What Can I Do to Empower My Advisory Council? 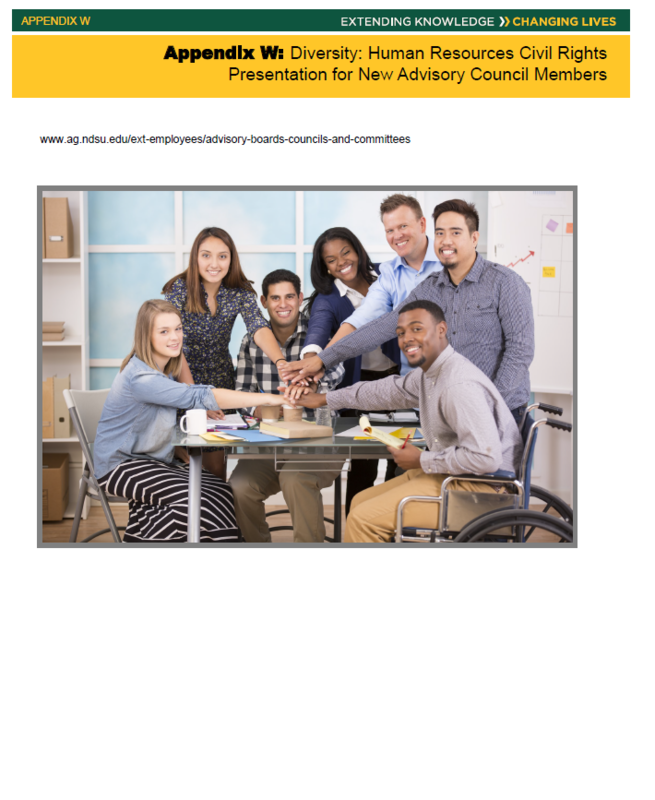 An Extension professional’s ability to manage his or her advisory council successfully is influenced greatly by several factors, including experience, training and a personal commitment to the concept of empowering volunteers. To empower, you have to share ownership. For some Extension professionals, giving up control can be very threatening. An advisory group should not get involved in certain things, especially if it serves in a volunteer capacity. Administrative items, such as agent/educator evaluations, professional salaries, and policies, should be left to the administrators, but council members may provide input. Advisory councils, other boards, and committees can play a vital role in dialoging with decision makers, fundraising, recommending program priorities and being a sounding board to the community. When Extension professionals give their advisory councils meaningful assignments, not only will meeting attendance and motivation increase, but the Extension professional will benefit from the satisfaction of knowing he or she has been responsible for developing leadership. What Can I Do If My Council Refuses To Be Empowered? This may be the case, especially if you inherit your council from a predecessor. Just go slowly and let your advisory group experience your passion and enthusiasm. It is contagious! If a council fails to feel empowered, that may signal that other problems exist. Every group must have a certain degree of mutual trust, respect, and friendship. Members learn from one another as well. Local advisory councils are very effective in encouraging officials to increase Extension resources. The Extension professional should not be seen as the coordinator of this effort. 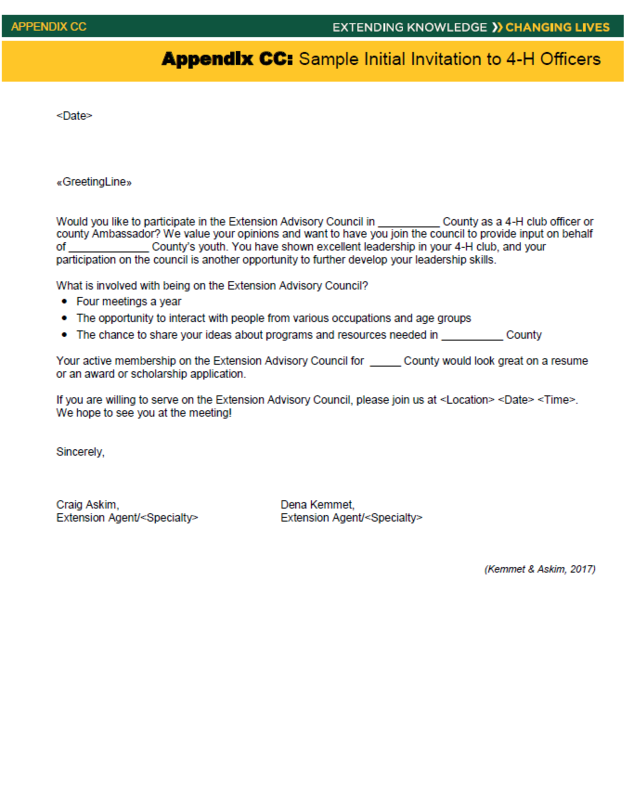 Give your advisory council responsibility for planning special programs or events during the year. Example: annual volunteer recognition program, decision makers’ breakfast or sponsorship of the Friend in Government Award. The Extension professional must let the group carry out the task and take ownership of the project. The purpose of the NDSU Extension Service is to create learning partnerships that help adults and youth enhance their lives and communities. Citizen input is important to making the NDSU Extension program meet the needs of North Dakota constituents. As Extension professionals, this is part of your program development and educational design competency. 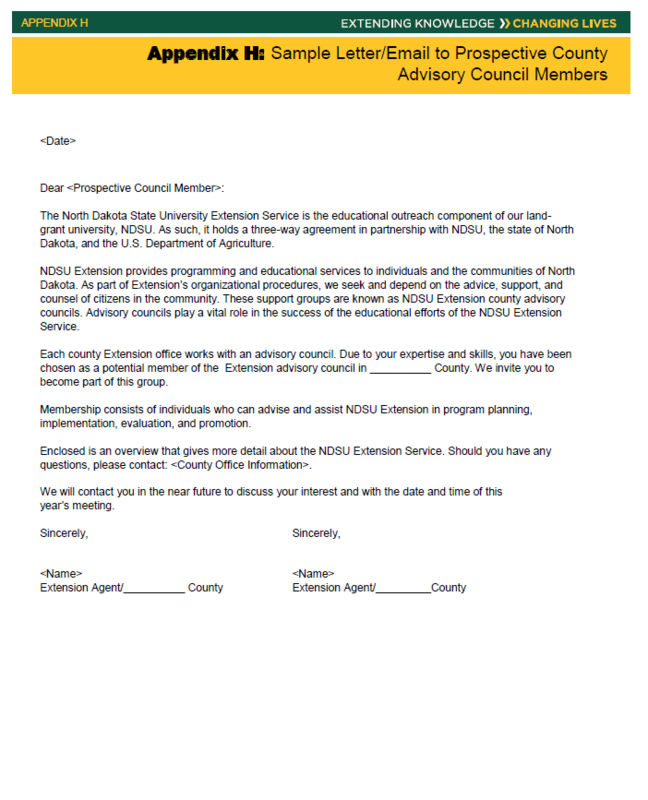 Involving your advisory council in giving input to the NDSU Extension program for each of the program planning areas ensures we are meeting the needs of North Dakota citizens. 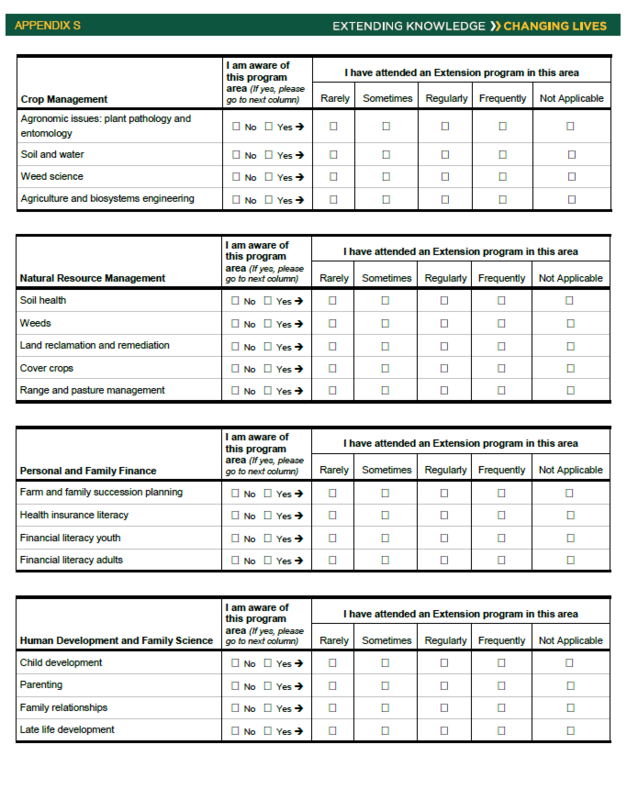 For more information on the NDSU Extension plan of work process and the program planning areas, please visit the NDSU program planning website. Rewarding council members for a job well done is important. This can be done with a special public recognition or a simple personal thank you. Our job as Extension professionals always is to make our council members feel special. 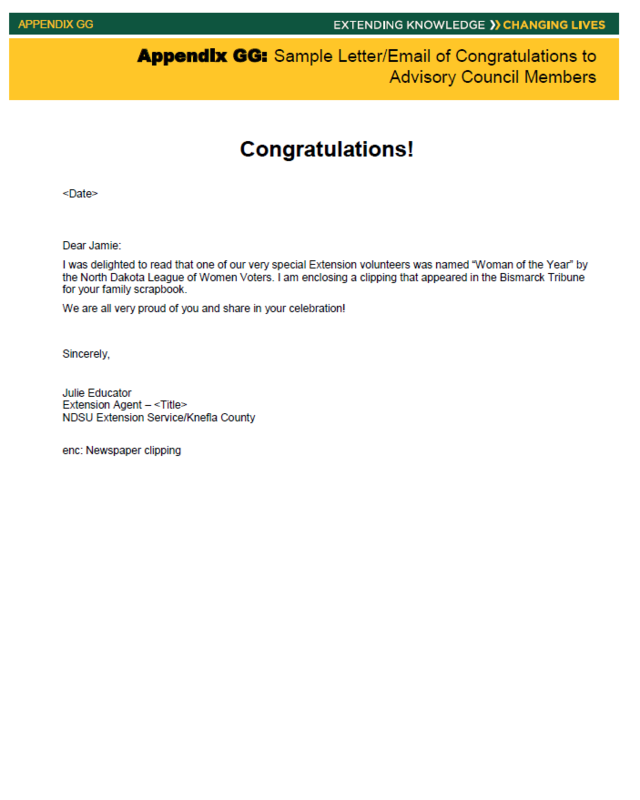 Extension advisory councils can be the award givers as well. 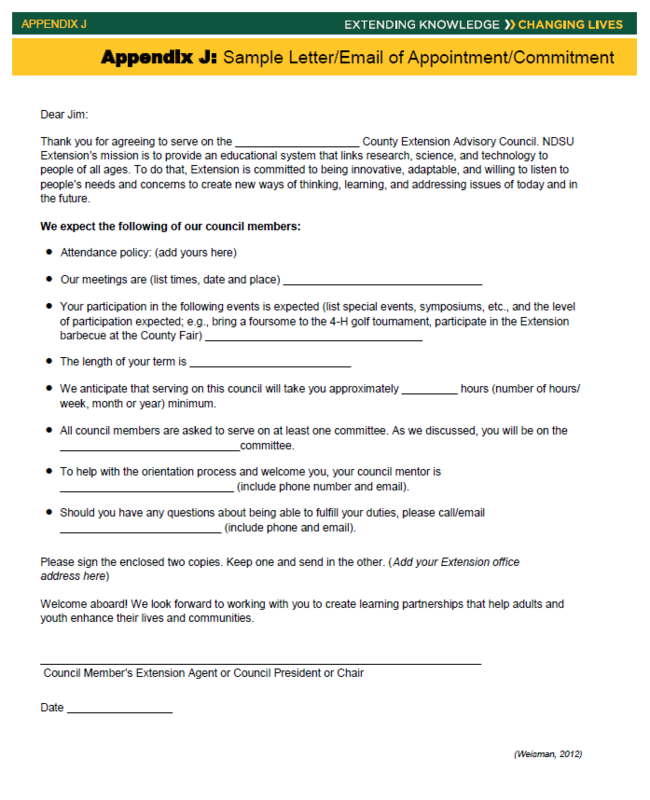 Awarding a deserving decision maker or community citizen with “A Friend in Government” or “Friend of Extension” award can be extremely beneficial for an advisory council member. Each volunteer appreciates being recognized in different ways. Volunteer recognition comes in three major styles: achievement oriented, affiliation oriented, and power and influence oriented. 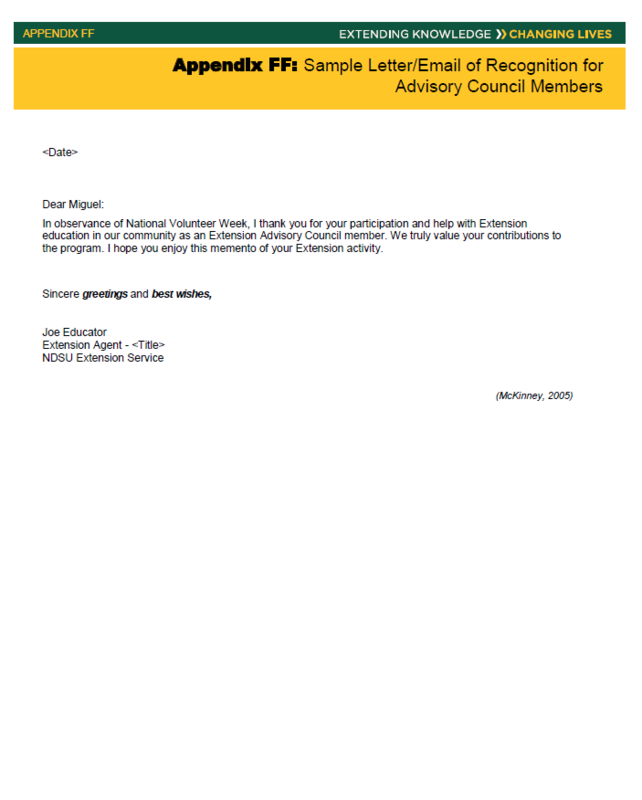 Volunteers appreciate tangible awards, letters of recommendation and opportunities to utilize their ideas. Affiliation-orientated volunteers enjoy unexpected, creative thank you notes and being invited to social events. Power and influence-orientated volunteers like having an impressive job title and are honored by being asked to be a featured seminar presenter, your media contact, or your public relations coordinator. Feature your council members on your Extension radio segment, your television spots or in your Extension newspaper column or blog. Also, give them the opportunity to speak in support of Extension education in your community. Each advisory member will bring a special talent to the group. Be observant and recognize these talents. You may want to establish subcommittees within your advisory council to allow members an opportunity to focus on areas of special interest. Example: fundraising, promotion and recruitment, long-range planning, speaking and special events. Ask advisory councils to evaluate different Extension programs and welcome their feedback and comments. Sometimes, an advisory group can give you a perspective that you have not considered. Show your appreciation to your advisory group by always having refreshments available during meetings and following up with a thank you note (Appendix EE). Most volunteers still prefer mailed thank yous rather than emails. This may take more time, but it is worth the effort. Ask your support staff to partner with you to send out thank yous. Did I consider my group when selecting a date, time, and location for the meeting, or did I routinely make the arrangements to fit my schedule? Keeping a consistent day of the week, time, and location of the meeting makes attending easier for individuals. 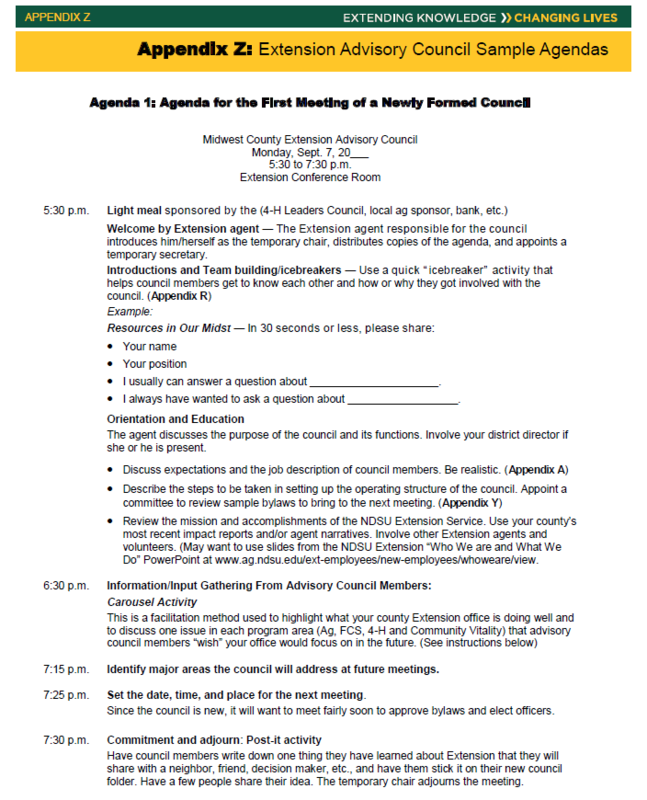 Example: Advisory council meetings are held every third Thursday of the month from noon to 1:30 p.m. at the county courthouse meeting room. Did I give my members ample advance notice of the meeting? Did I convey the purpose and importance of the meeting? 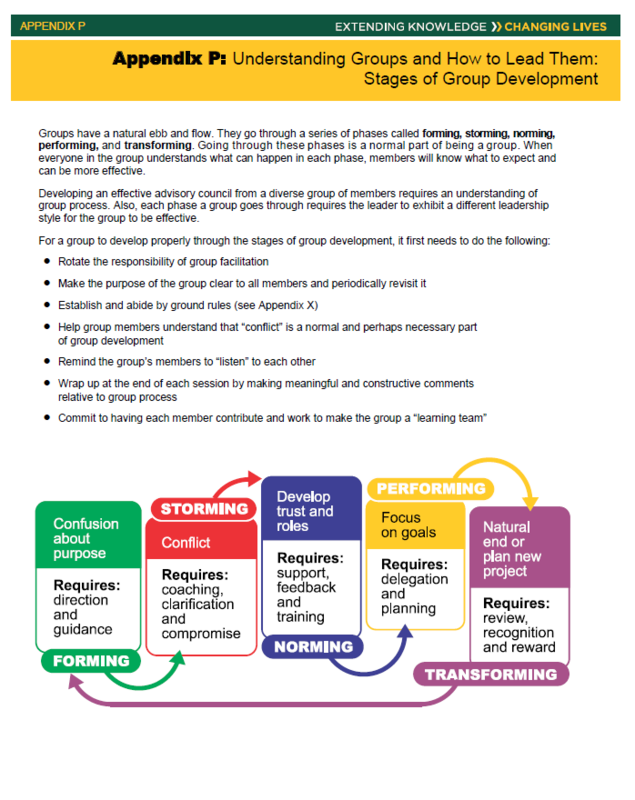 Did I work collaboratively with the council chair in developing the agenda? Do I have the room arranged to maximize communication? Do I have adequate light and temperature in the room? Have I promoted my land-grant university (NDSU banners, posters, etc.)? Do I have the necessary equipment and supplies? Was I present to greet my volunteers as they arrived at the meeting? Did I open the meeting by thanking the volunteers for coming? Did I introduce new advisory council members or guests? Did I make sure that all members were given an opportunity to participate in the dialog? Did I provide refreshments for my volunteers when they arrived? Did I/we establish a date, time, and location for the next meeting? Did we provide ample parking and offer to provide accommodations for those with special needs? Did I send follow-up correspondence with minutes? Did I communicate with those not in attendance? (See Appendix HH). 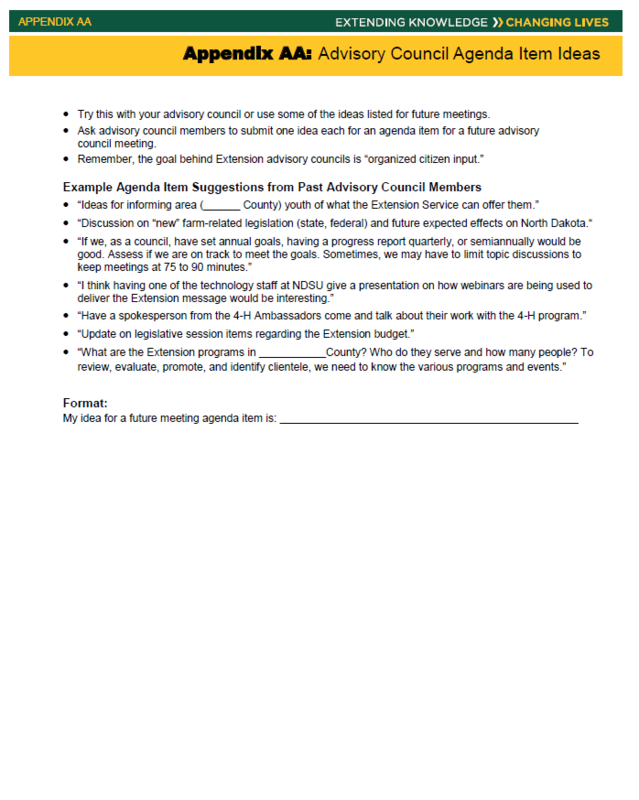 Did I follow through with recommendations and/or suggestions the advisory council made? 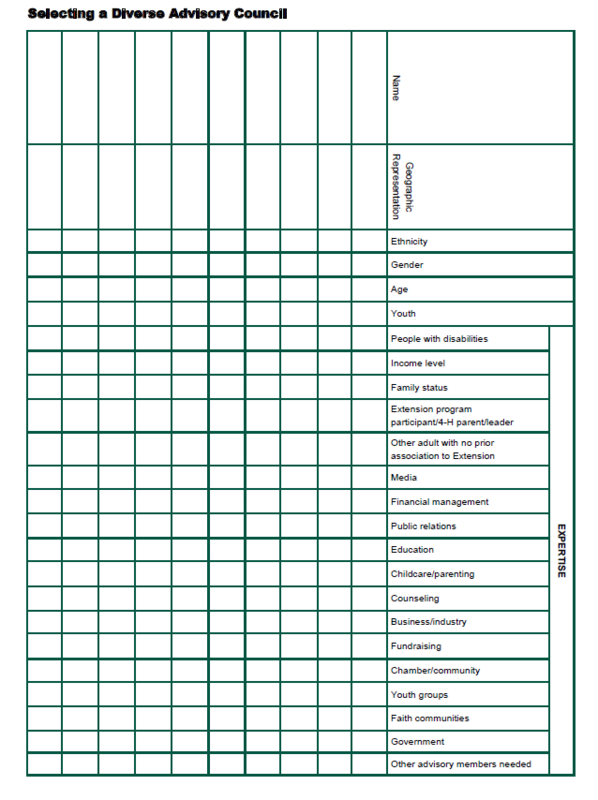 Assign tasks to people: Specific action steps should be assigned to specific individuals. 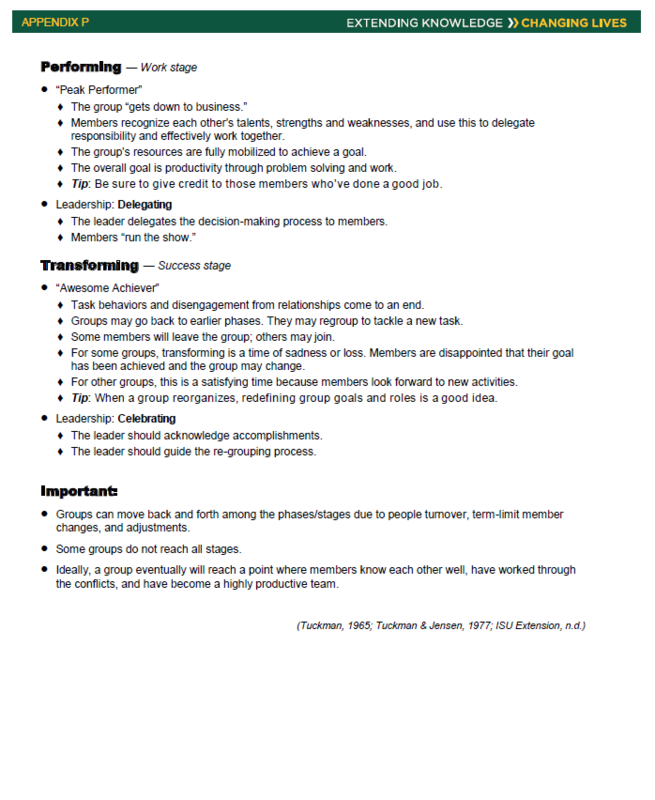 If you have large tasks, make an individual a subcommittee chair to facilitate a smaller group. 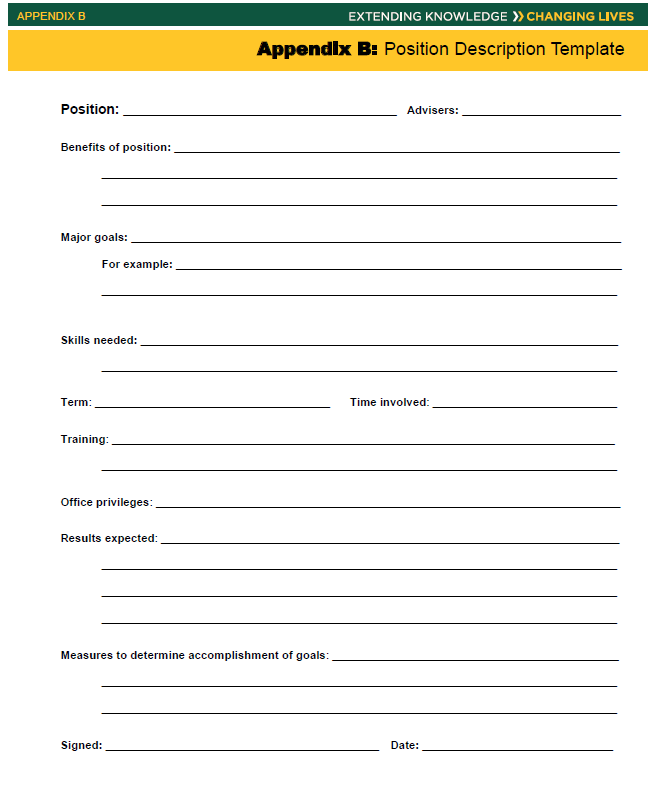 Assign deadlines: Give individuals a definite time for completing the task. A common deadline is by the next meeting. 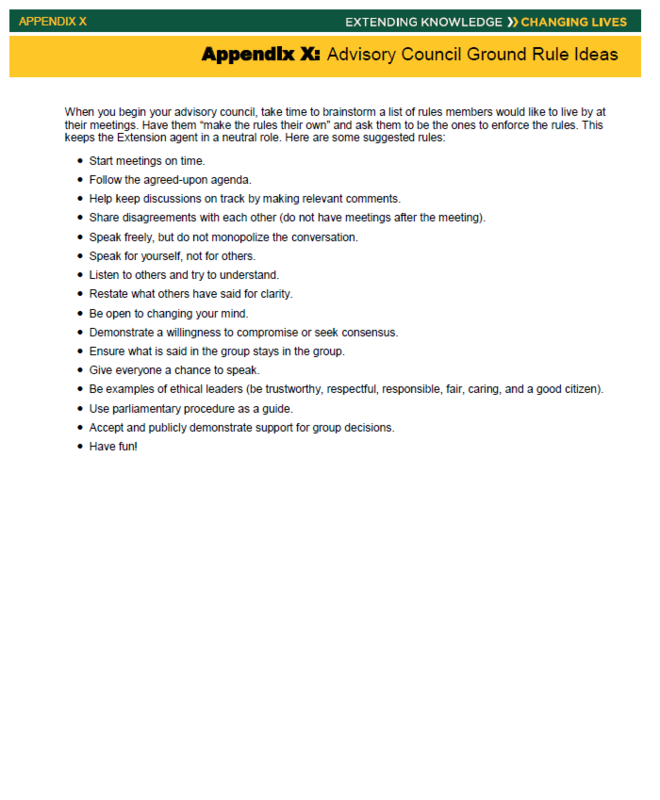 Evaluate the meeting: Distribute a short survey that asks what the participants thought about the meeting and how future meetings can be more useful. End on time: Members tend to get disenchanted when meetings are too long or go over their time limit. Be extremely time conscious and end on time. Be prompt with follow-up: Send all council members a recap of the action steps and assignments within a few days following the meeting. This serves as a reminder and also as an update to absent members. End on a positive note: Affirmations are very popular and provide a source of motivation to the group. Use inspirational quotes, motivational poems or uplifting short stories. Recognition: Why Say Thank You? Extension volunteers are busy people. They are doing us a tremendous favor by serving on our advisory councils. We constantly need to think of them as our guests. They are serving at our request and giving us many gifts, such as wisdom, commitment and loyalty, in return. As Extension professionals, we need to honor, respect, and appreciate these gifts. Installation ceremonies: Take a little extra time to install your advisory council members and officers at the beginning of each program year. Nametags: Have official nametags created for each council member to wear at meetings and other community events where they are representing Extension. You can purchase them online for a minimal amount. Rewards: Reward your volunteers for special accomplishments. This can be as formal as presenting a plaque at a public occasion or as personal as picking up the telephone. 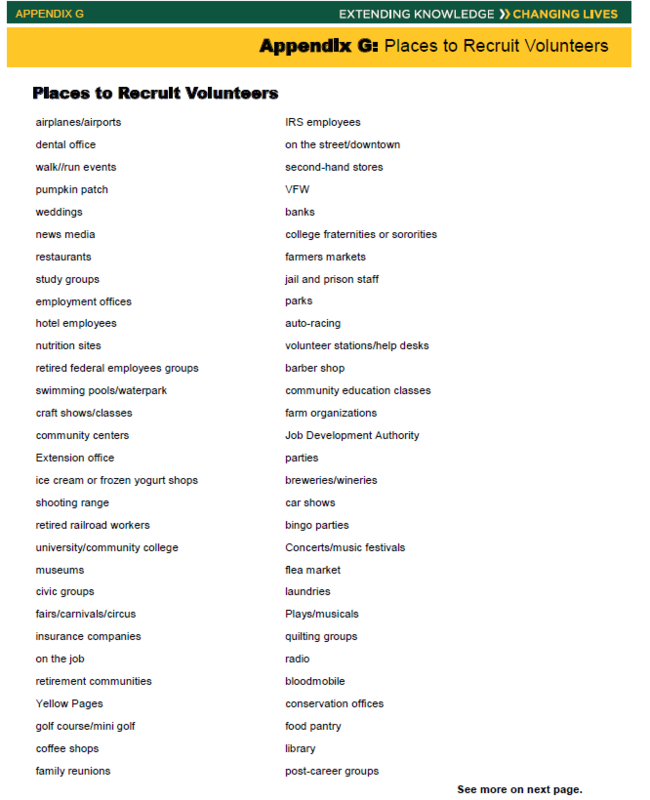 Keep in mind the recognition style of each volunteer as referenced above. You would think the courtesy of saying “thank you” would be automatic, but we live in such a hectic world that we need to remind ourselves from time to time how important this simple task is in managing our advisory council. Ownership: Don’t be afraid to share or even give up ownership of a special project, program or issue. By empowering and encouraging others, you empower yourself. Partnering and collaboration: Today, many organizations and councils are involved in the same community issues as Extension. 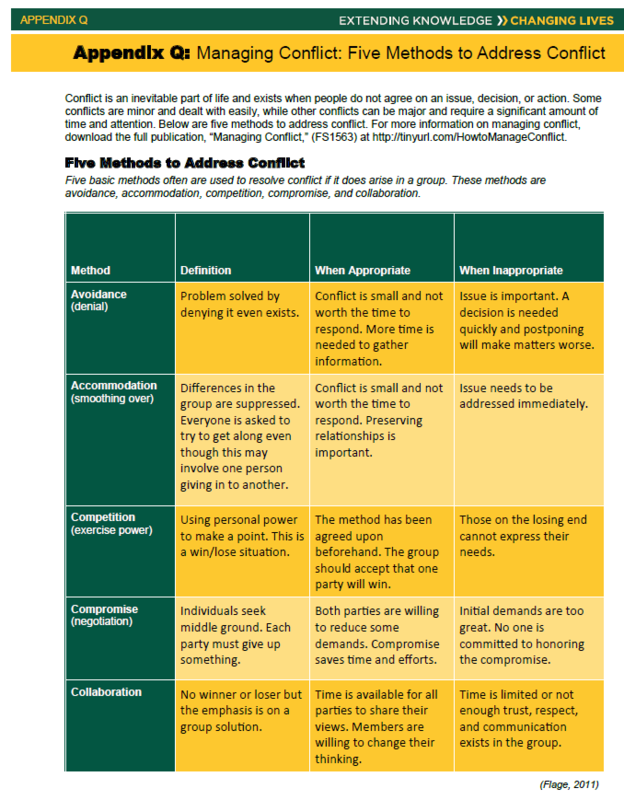 Rather than consider these groups as competition, work to engage them in partnering and collaboration. Extension can be the catalyst and facilitator in bringing these groups together. In-service training and experiential opportunities are critical in teaching Extension professionals how to train, empower, motivate and recognize their Extension advisory councils. Communicating your training needs to your supervisor and Extension specialists and participating in professional development opportunities when they are offered are important. Feeling threatened by sharing leadership, not being enthusiastic about your own program or failing to recognize the importance of your volunteers properly may result in challenges with your advisory council. We have devoted this publication to the empowerment of others, but before we can successfully empower others, we must first empower ourselves. Evaluation is a crucial part in keeping council members engaged and helping them recognize their needs and strengths. Evaluation serves as an opportunity to check that the council is on track. It identifies opportunities for change that could yield better results. Evaluation also validates the link between the mission and purpose of Extension, the program plans of Extension professionals, plans for the council, and actual work being undertaken, conducted, or accomplished. 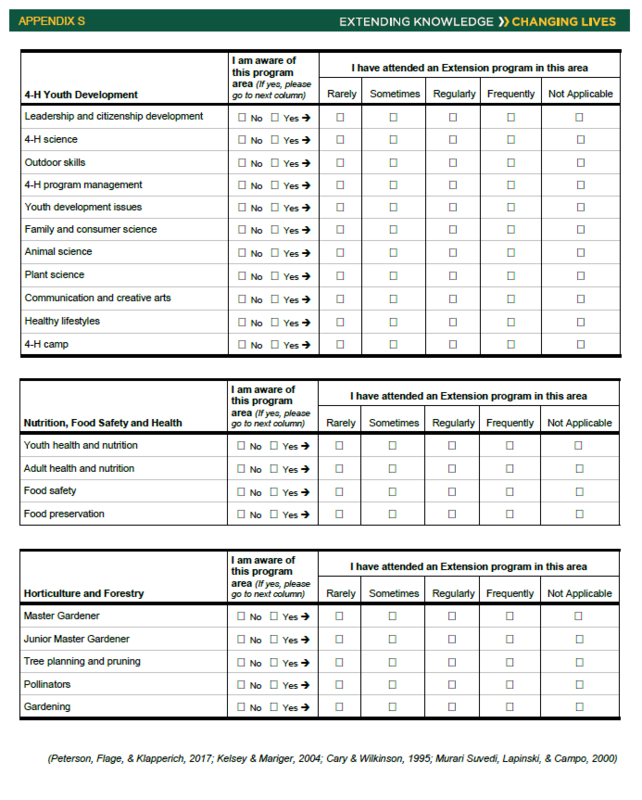 In relation, it helps identify the effectiveness of council committees and the quality of the relationship between the council and Extension professionals. Evaluating the council members’ initial knowledge of Extension (Appendix S), evaluating their knowledge gained each year (Appendix BB), having the council evaluate its overall performance (Appendix KK), and having members do a self-evaluation of their work on the council are all pieces involved in building a strong Extension advisory council. Consulting and reviewing the advisory council position description (Appendixes B and C) is helpful during this process. Many thanks to the individuals from the NDSU Extension Service who shared their county examples, reviewed the guide and appendix, and helped organize this collection of resources. Determine the purpose of the advisory council: To build the membership of the advisory council, develop or clarify its purpose and scope. For example, the council can provide timely knowledge about trends and needs, as well as address upcoming political, legislative, and regulatory developments. 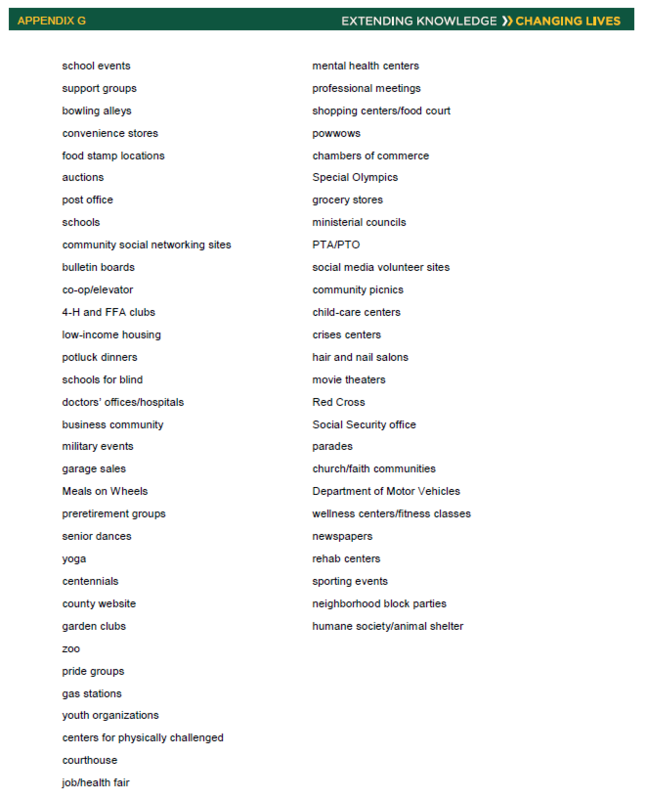 It also can help identify new audiences/partners and look at programs with an open mind. Choose the right people: In general, look for diverse skills, expertise, and experience. Members should be problem-solvers who are quick studies, have strong communication skills, and are open-minded. Involve current membership in recruiting and orienting new members (Appendix D). Set expectations: When inviting a prospective member to join the advisory council, explain the roles, responsibilities and expectations (Appendixes B and C). Orientation of new advisory council members will produce higher levels of motivation. 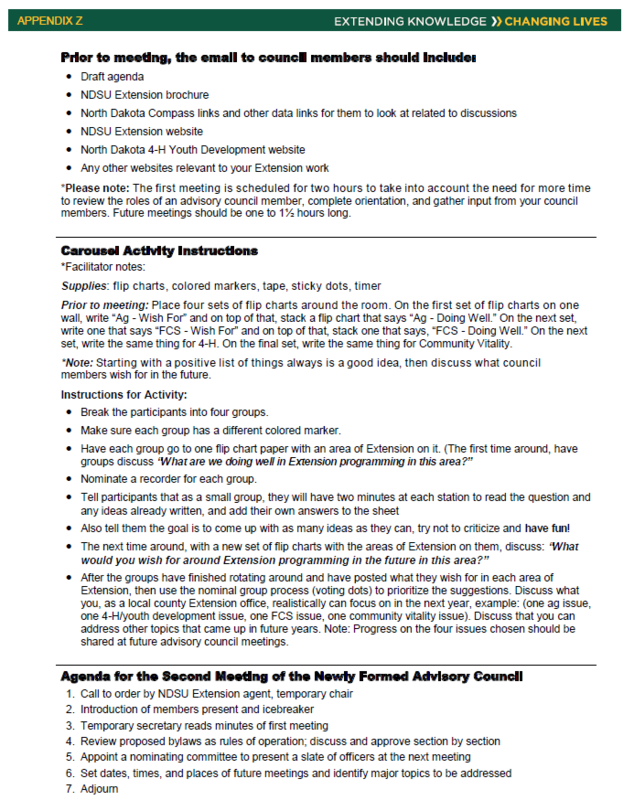 Get the most out of advisory council meetings: Prepare for meetings well in advance. Choose a location that is comfortable and free of distractions (Appendix N). Give careful thought to developing the agenda (Appendix Z) and managing the meeting (Appendixes P and Q). Solicit input for the agenda (Appendix AA) and distribute important information ahead of time (Appendix DD). Run the session as you would any professional meeting and follow it with an action plan. Ask for honesty: An advisory council must be open and frank. Expect differences of opinion. 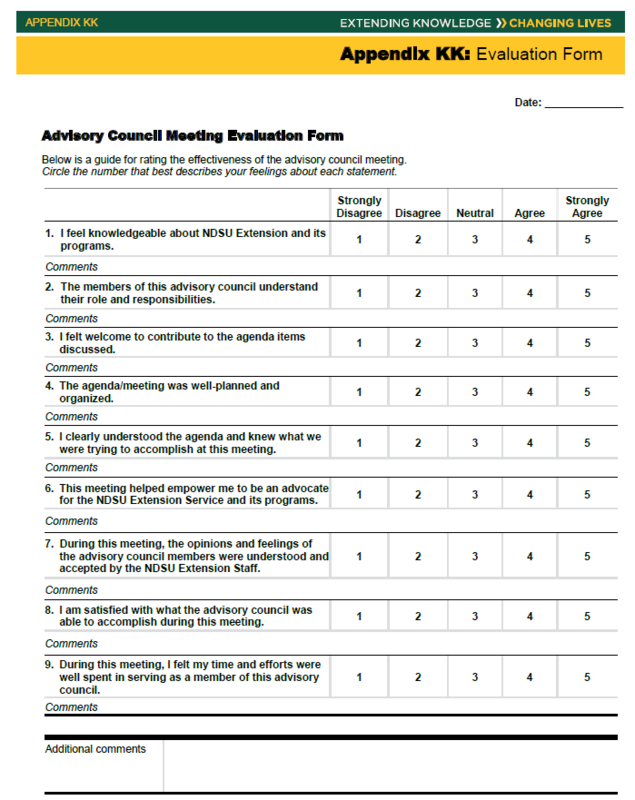 The council should also suggest ways of correcting the challenges members identify with an evaluation (Appendix KK). 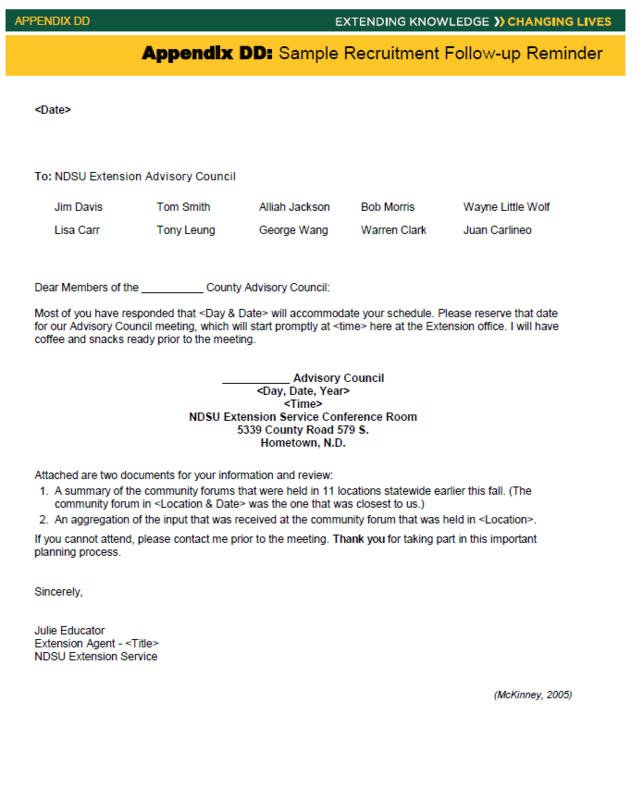 Extend courtesies to advisory council: Provide food and beverages. 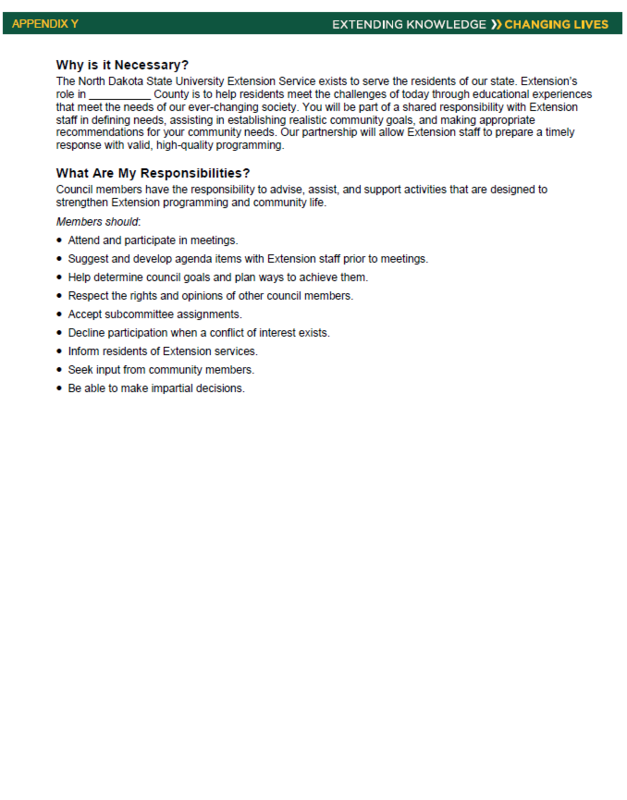 Keep in mind that members will benefit from council involvement. Being on a council will expose them to new ideas, perspectives and resources. It also will expand their networks and provide them with a way of giving back. Respect, appreciate, and recognize the council’s contributions: An extension professional must put a high priority on his/her commitment to volunteer leadership development. Do not waste the council members’ time but actively engage them in decision making. Listen to what they say. Remember: Not all suggestions need to be adopted. 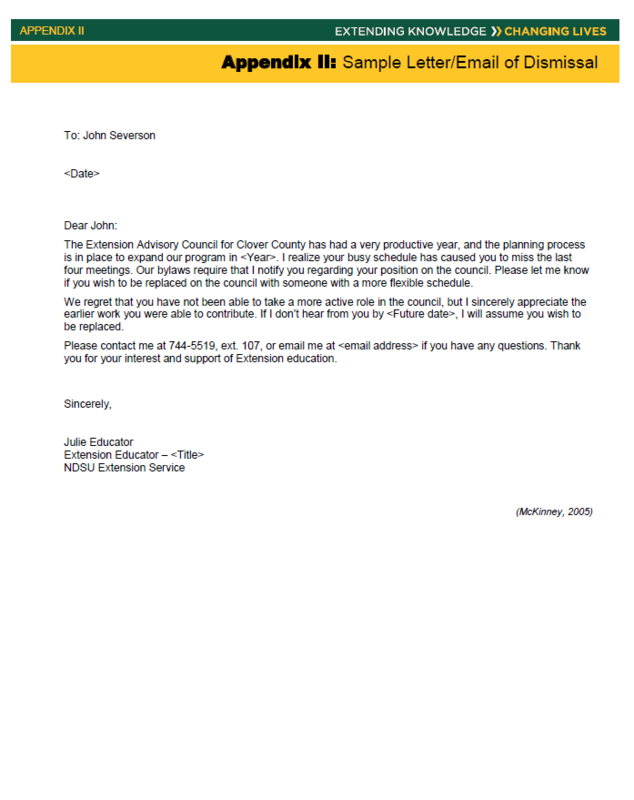 Consider, “Does this work for my program/county? Am I comfortable with that?” Then make a decision. Thank members regularly in many different ways – in person, in handwritten notes, via email, in your newsletter – for the work they are doing (Appendixes EE, FF and GG). 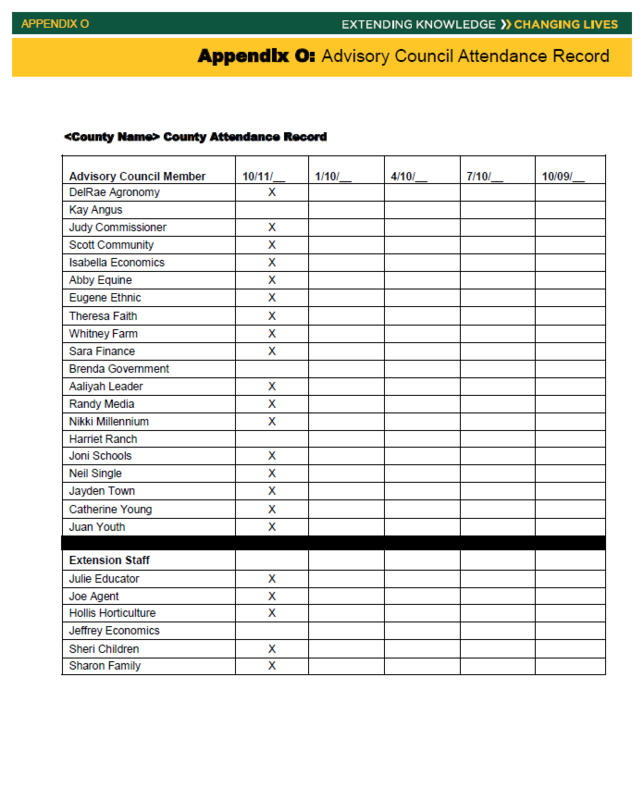 Keep council members informed: Once they’re on the board, keep them excited by giving them frequent updates (4-H newsletters, impact reports, monthly or quarterly narratives, legislative updates, etc.). The fact that they have agreed to be on a council means they care, so keeping up to date will help them be of greater value to you as a supporter and promoter. 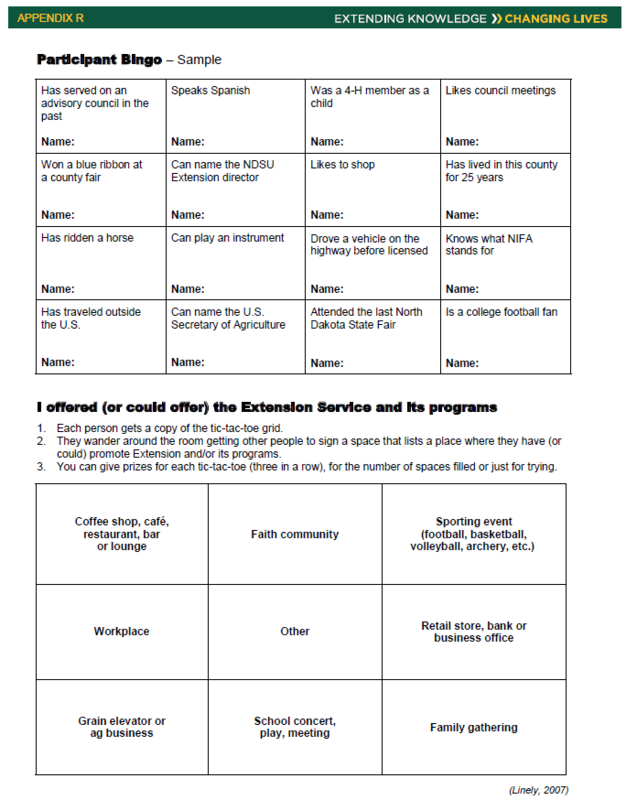 Let members know how their work has helped progress toward the Extension program goals. 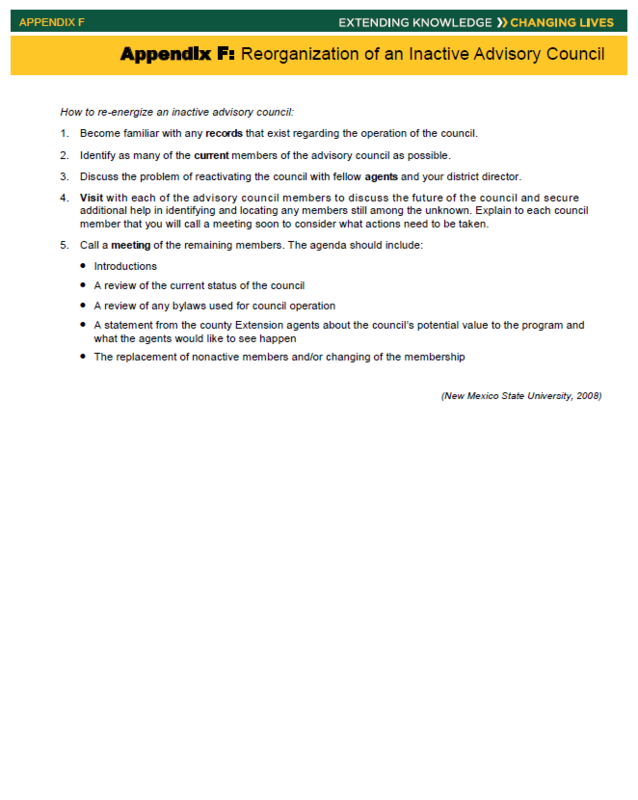 Remove ineffective council members: If unseating particular members becomes necessary, follow the policy or procedure that is specified in the council’s bylaws in consultation with your supervisor (Appendix II). The bottom line is that an advisory council needs a sense of purpose, doable tasks, a timeline, praise and recognition, and a belief that its input is valued. Members need regular guidance to be sure they are staying on task. 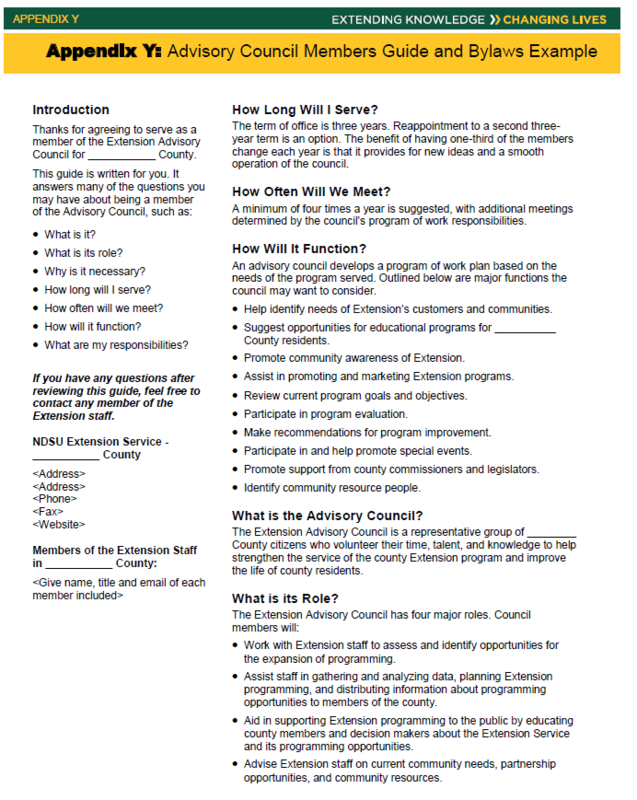 With a little work, the advisory council can be a real asset to enhancing and sustaining your Extension program.